Remember the other day when I posted the snowflake cookies we made, and I said I'd talk about the other cookies later, when they were finished? Well, this is what else we made with that basic cookie dough. I have some stackable cookie cutter sets, and two of them are holiday-themed: a gingerbread man and a Christmas tree. These are a lot of fun. You use them just like other cookie cutters, then you have the option to decorate each piece and stack them for a 3 dimensional effect, like I did with the gingerbread men. 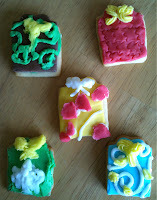 I had more rolled fondant to decorate them with, and I used the same cutters to cut out fondant pieces to cover the cookies. For some reason, I was short a waistcoat and bow tie cookie, so the chocolate gingerbread man is a little flat. These were made with the same white rolled fondant I used on the snowflake cookies, and I colored some of it blue and green. The red is actually cherry-flavored Fondarific, and the brown is chocolate Fondarific. This stuff is awesome, by the way. It's not the cheapest rolled fondant out there, but it's some of the best tasting, AND it comes pre-colored and in a large variety of flavors. The blue man's waistcoat I iced with buttercream then dipped in silver sprinkles. The green just didn't look right on him, and I thought he could use some sparkle. The eyes and noses are rainbow chip sprinkles, and the mouths are either more rainbow chips or shaped rolled fondant. My kids decorated the trees and presents, and they did a fantastic job. We even have a green mini snowman (with arms) and a snake. I sense a smiley face theme this year. 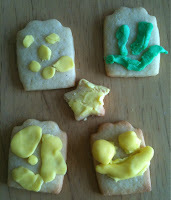 The yellow is lemon Fondarific, attached to the cookie with some buttercream I colored yellow. Oh, and here are some stars and a few snowflakes that were left out of the other post. I have plans to make more stuff, and I'll try to keep my blog updated.